Beware of Fake Online CPR cards! 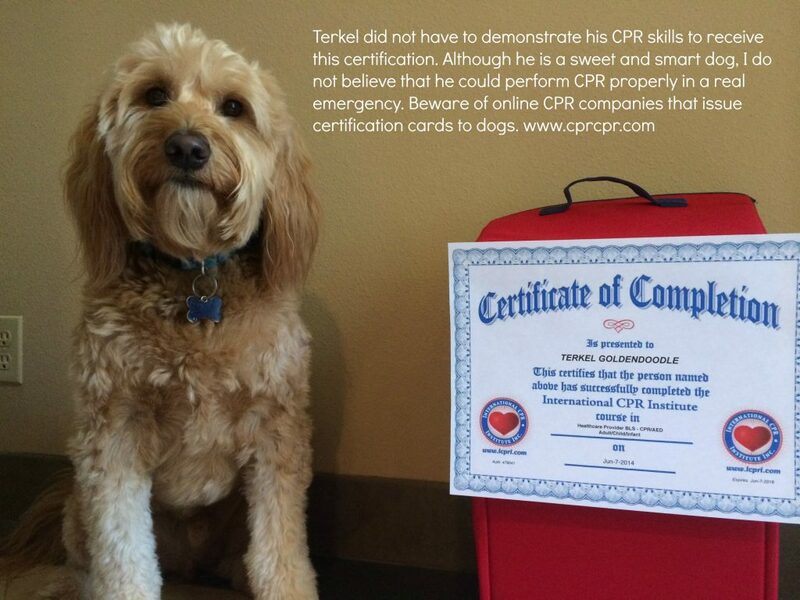 Notice his certificate says Terkel Goldendoodle. Over the past few years, I have noticed a lot of fraudulent CPR and First-aid classes being offered in the San Francisco Bay Area and over the computer. Each week, we have students who come to take a retraining with us, since the certification card they received from their original training course was not accepted at their worksite. This is very frustrating since the students not only have to pay for the course twice, but they must also spend their time taking a course again. Online CPR classes are an internet scam that has been around for a few years. It is not possible to receive a valid CPR certification card over the computer. Since CPR involves skills that must be performed under the watchful eyes of an American Heart Association instructor, online CPR courses are fraudulent. It is possible to find a website where you pay $40-$60 and then immediately print out a card. Does that sound valid? How do you think your supervisor will react when they find out you tried to get a fake CPR certification card? Warn your friends and family about this latest internet scam or better yet, print out this poster below to warn fellow coworkers. Use terminology like “AHA approved”, AHA compliant”, or “follows AHA guidelines”. Do not require any type of skills testing. The class is conducted 100% online. Download a free CPR Scam Poster to warn your coworkers about this latest internet scam. The American Heart Association has developed a wonderful blended elearning BLS certification class for the busy healthcare professional. These classes combine an interactive computer based training program with a skills practice and testing with an American Heart Association BLS instructor. 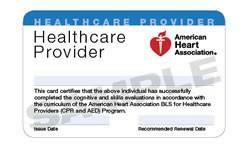 You may have heard about the recent news about fraudulent CPR certification cards being handed out to medical and healthcare professionals. This case has two disturbing factors. The CPR instructor who allegedly handed out cards to students, who did not take the training, acted very inappropriately. But also the medical and healthcare professionals who accepted the cards were also at fault. If someone is in the medical or healthcare field, their job requires them to perform these life-saving skills. How can they perform their job properly without having the correct training. The people who suffer are those who need high quality CPR. Over 50 Hospital Employees Fired for Attaining Fake CPR Cards. The state of California requires childcare providers to have 8 hours of CPR and First-aid training once every two years. It is possible to find CPR training companies that offer this course in 6, 4, or even 2 hours. However, if a childcare provider takes one of these shortened courses, their certification card would not be valid and they would have to retake the course. 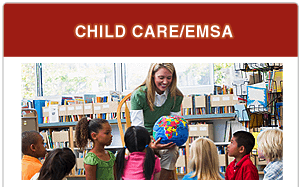 EMSA has issued a fraud alert, since there have been so many childcare providers that have taken a course that is not valid. They have even included a list on how to choose an approved Pediatric First-aid and CPR program. View upcoming Pediatric First-aid Classes in the SF Bay Area. Safety Training Seminars has been providing high quality CPR and First-aid training courses in the San Francisco Bay Area since 1989. Their American Heart Association License is CA-20784 and their EMSA license is 0204-DC. Students receive their certification card on the day of the class. We are a member of the Chamber of Commerce and have A+ Rating with BBB. Call us if you have any questions: 415-437-1600 and we hope to see you in one of our American Heart Association courses soon. There are many different CPR companies to choose from in the San Francisco Bay Area and Sacramento. 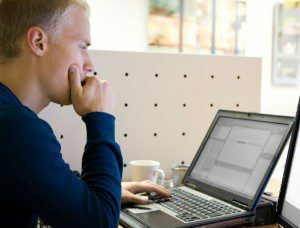 It is important that you do some research to find the perfect company for your training needs. Would you prefer doing business with a locally owned company or with a company from out of the state or out of the area? Beware of out of state companies since they normally only offer training courses about once per month. It is very common that they cancel classes if there is a low turnout and then you must wait another month for your class. Safety Training Seminars is a locally owned business. It is always nice dealing directly with an American Heart Association Training Center. Safety Training Seminars is an official TC with the AHA and the license number is CA-20784. EMSA has issued a fraud alert about unauthorized providers of Pediatric CPR and First-aid classes in the Bay Area. If you take a course from an unauthorized provider, you would have to retake the course again. Safety Training Seminars license number with EMSA is 0204-DC. You can view our license here. Find out when you will receive your certification card. Many people need their CPR certification card for job requirements and need their card right away. When booking a class it is important to know when you will receive the card since some companies mail out the card which can take 2-3 weeks for you to receive. Safety Training Seminars issues the official American Heart Association certification card on the day of the training. Safety Training Seminars is now in our 27th year of business. Yeahhh. We have great customer service. We are available by phone during the week and weekends and our staff speaks Spanish too. Now here is a video on how to save an infant who is choking.